Historically, the Rose Bowl is one of the best games of Bowl Season. It has always featured two of the better teams in the country and this year is no different. Well—maybe a little different. Since it is one of two CFP Semifinal games, it will feature two of the best teams in the country, the Georgia Bulldogs and Oklahoma Sooners. At one point in the season, both teams looked like they may fall short of the ultimate goal (the CFB Playoffs). 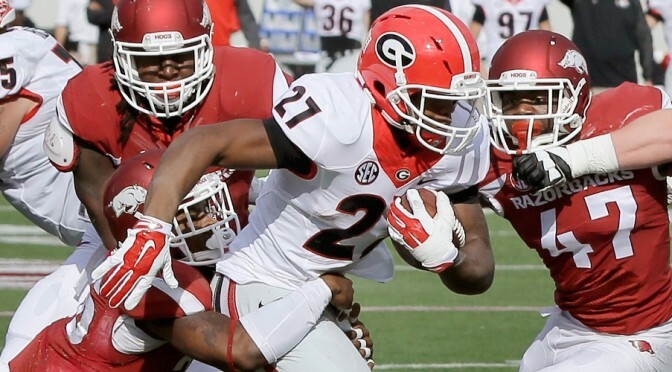 When Georgia was dominated by Auburn in early November, it didn’t look good for the Bulldogs. They were the No. 1 team at the time and would drop out of the spot because of the loss. But they didn’t fall too far. If they could get back on track, maybe they’d get another shot. Sure enough—they met Auburn in the SEC Championship and exacted a little revenge by dominating the Tigers, 28-7. Oklahoma’s journey was a little different. Their loss came earlier in the season than Georgia’s (October 7; to Iowa state). The timing allowed them to edge their way back up the ranks with each successive win. So, when Georgia, Notre Dame, and Miami lost, they were in a position to move up to No. 2 in the CFP Rankings. They couldn’t be more different as teams either. Georgia relies on a dominant run game and even more dominant defense. 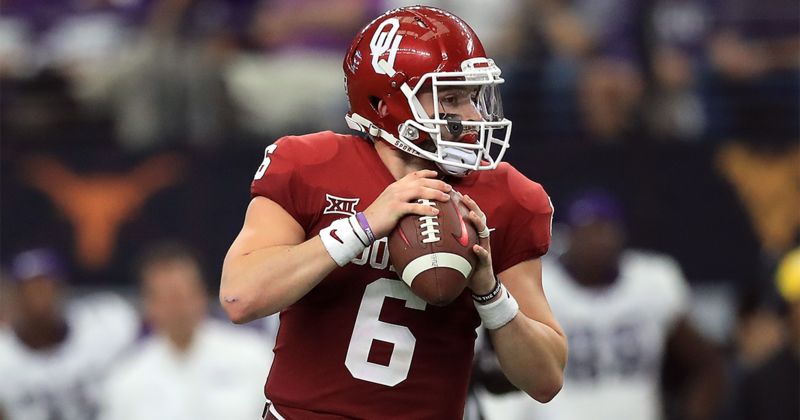 For Oklahoma, it is all about the passing game. They are capable of running the ball well, and their defense isn’t bad. But if the Sooners are going to beat anyone, it’s going to be behind Baker Mayfield and the passing game. Nick Chubb and Sony Michel will be the two running backs everyone wants to see, but the Sooners have a pretty good one of their one in Rodney Anderson. Prior to his emergence against Kansas State, the Sooners went with the running back by committee approach. They did a decent job of running the ball that way, but when Anderson took over the lead back duties Oklahoma’s run game exploded. Of course, it never quite matched the power of the passing game. There was no doubting the talent and ability of Baker Mayfield entering the 2017 season, but question marks were surrounding his receivers. He didn’t really have a guy that stood out as his new go-to, No. 1 receiver. As it turns out, that was no big deal. His tight end, Mark Andrews, ended up being his favorite target (58 receptions) followed by a pair of wide receivers (Marquise Brown, 49 receptions and CeeDee Lamb, 40 receptions). Seven other guys made at least ten catches. Mayfield is going to have a serious challenge on his hands against Georgia’s No. 2 pass defense (158.3 yards/game allowed). It’s not like he’ll be able to look to the run game to loosen the defense up. Anderson is going to be hard-pressed to find room against the Bulldogs front seven (No. 11; 112.6 yards/game allowed). But as challenging as it will for Mayfield and Anderson to get the job done, the Sooners run defense has to stop a three-headed monster in Chubb, Michel, and De’Andre Swift. They aren’t bad against the run (No. 41; 144.2 yards/game allowed) but they haven’t faced a trio like this. It would be a lot of fun to see Baker Mayfield play another game whether it is against Clemson or Alabama. His ability to make magic happen is fun to watch, and there is no telling how long it will be before he gets a chance in the NFL. Oklahoma’s defense does not match up well against the Georgia run game. The Georgia defense will also be the toughest Mayfield has faced all season as well. He’ll probably figure out a way to make magic happen. But can he do it enough? Oddsmakers favor Georgia by 2.5 points. Feel confident in giving the points up and taking the Bulldogs.